(acc. DIN 18202 Tab.3, Zeile 4) Bases must be level, stable and able to take a load. Unevenness %gt; 3 mm at 1 m length must be compensated. Fix QuickFloor FL on heating elements. Tape joints with textile tape. 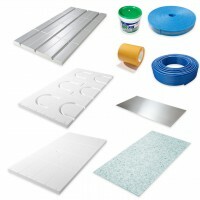 Only attach tiles with Mapei Elastorapid. Only fill joints with Mapei UltracolorPlus.